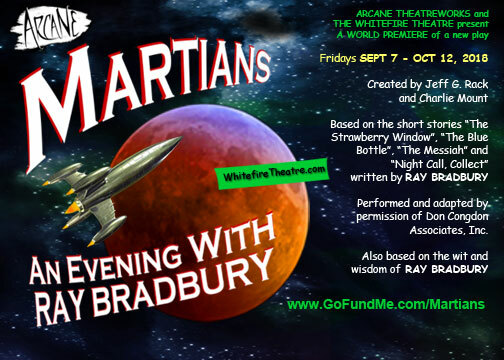 Now, with co-creator Jeff G. Rack, Charlie is bringing the wit, wisdom, and writing of the iconic science-fiction writer to the stage in a production called “Martians: An Evening with Ray Bradbury.” Based on the short stories “The Strawberry Window,” “The Blue Bottle,” “The Messiah,” and “Night Call, Collect,” as well as the musings of Mr. Bradbury himself, the fully authorized show will run Friday nights from September 7th through October 12th at the Whitefire Theatre in Los Angeles, California. I’m always happy to promote the work of my friends, but rarely do I point people to fundraising efforts. In this case, though, in addition to supporting a spectacular work of art, the GoFundMe campaign for “Martians: An Evening with Ray Bradbury” also features some killer rewards. I know a lot of Star Trek readers appreciate the work of Ray Bradbury, and I’m hoping that some of you can help Charlie out, both for his sake and for the living memory of one of the greats of SF literature. Please give it a look. Any contribution at all will help.